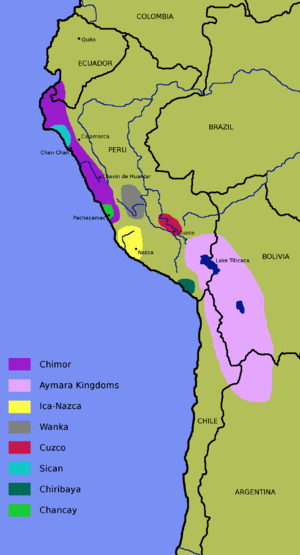 Chimor (also Kingdom of Chimor) was the political grouping of the Chimú culture that ruled the northern coast of Peru beginning around 850 and ending around 1470. Chimor was the largest kingdom in the Late Intermediate period, encompassing 1,000 kilometres (620 mi) of coastline. The greatest surviving ruin of this civilization is the city of Chan Chan located 4 kilometres (2.5 mi) northwest of the modern Trujillo, Peru. 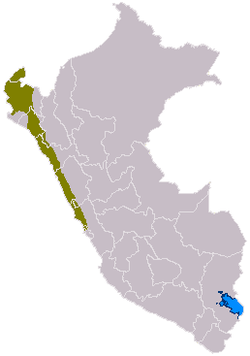 The Chimú grew out of the remnants of the Moche culture. The first valleys seem to have joined forces willingly, but the Sican culture was acquired through conquest. They also were significantly influenced by the pre-Incan Cajamarca and Wari cultures. According to legend, its capital of Chan Chan was founded by Taycanamo, who arrived in the area by sea. Chimor was the last kingdom that had any chance of stopping the Inca Empire. 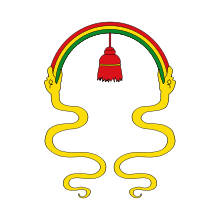 But the Inca conquest began in the 1470s by Topa Inca Yupanqui, defeating the emperor and descendant of Tacaynamo, Minchancaman, and was nearly complete when Huayna Capac assumed the throne in 1493. 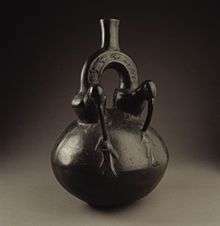 Chimú ceramics are usually stained black. It is also known for its exquisite and intricate metalworking, one of the most advanced of the pre-Columbian era. ↑ "Chan Chan : Capital of kingdom Chimu - UNESCO". Retrieved 29 March 2012.